We had slushy snow yesterday and today is almost 60 degrees in NYC, the weather is just plain weird, in the winter I want soup and even though it’s like Spring today I made this because it’s quick and easy and when the temps plummet tomorrow I will have a steaming hot bowl of broccoli soup ready for me. I am also on a low carb diet and need warming satisfying food that are not laden with carbs. Looking in the fridge I had quite a few vegetables I needed to use along with a couple of small potatoes. 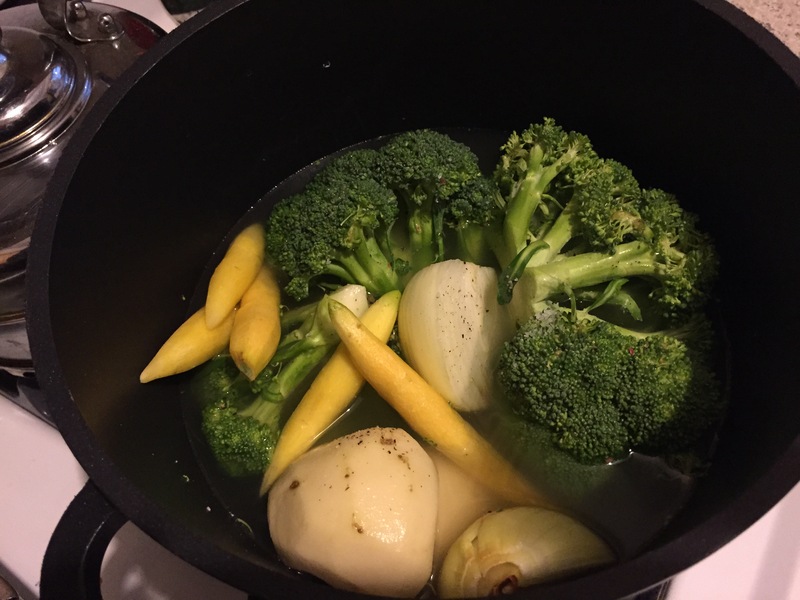 Although I am calling this cream of broccoli it really has other vegetables in it also and no recipe required. I am keeping it super simple, will puree add a little butter and a little cream just to make it decadent, a tiny grating of nutmeg, some salt and pepper and there you have it. Garnish however you like, I simply grated some cheese on top. Soups on! Note: I made this a throw everything in the pot sort of soup, you of course can saute your onions, oven roast the vegetables and this will add a more complex flavor. It would be delicious like that but I just made a simple soup without the steps. Just have to add very excited tonight is the season premiere of Downton Abbey, love that show!! Salt, pepper pinch of nutmeg is optional also. Throw everything in a soup pot, boil until the vegetables are soft and very tender, fish out the vegetables separating from the broth, set the broth aside. Let cool a bit, puree in food processor or blender adding a little broth as needed . Add the puree to soup pot and enough of the broth so it’s the thickness you like. Add a little butter (I added a generous tbs, and about 1/4 cup heavy cream. Season with salt, pepper and a grating of nutmeg if you like.NOTE If you want to freeze this soup freeze the puree without the butter and cream, add that later when you heat if so desired. Yes it’s so easy you can sit, relax and do other stuff while the vegetables are cooking. I freeze the puree in individual serving sizes so I can always have a bowl of soup. Easy and simple is the way to go. Thanks Teagan. It is wacky, by Wednesday the high will only be 20 degrees and lows in the single digits. Brrrr…… Thanks Cheryl. Stay warm! Keep the soup on! Thanks June! Yes hot soup on a cold day is wonderful. Great minds think alike. I have keep off 30 pounds for 18 months on a low carb diet – goal is to drop 10 more before my birthday end of April…Also, I am a Downton FREAK! For me low carb is the best way to drop the pounds along with portion control. Very excited to see Downton tonight!!! Best of luck with the 10 lbs, I hope to lose 10 soon. This looks perfect to make today! I love broccoli soup and am always on board for a no-recipe dish! Can’t wait to see Downton Abbey tonight too!!! Yay, another fan. Thanks and it’s liberating not having to use a recipe. It’s healthier than what I have been eating also. I am eating less carbs, cutting out bread, pasta, rice and potato. I have to have a little decadence like some butter or cream if I do without other stuff. Thanks can’t wait for tonights show. I did enjoy, I never saw Breaking Bad but think I would really like it if I watched it. This sounds like a very good winter day (or spring-like winter day) soup. I love making different soups, but my daughter is fussy and only likes tomato soup. She does, however, like broccoli… I wonder if she would eat it as a soup? 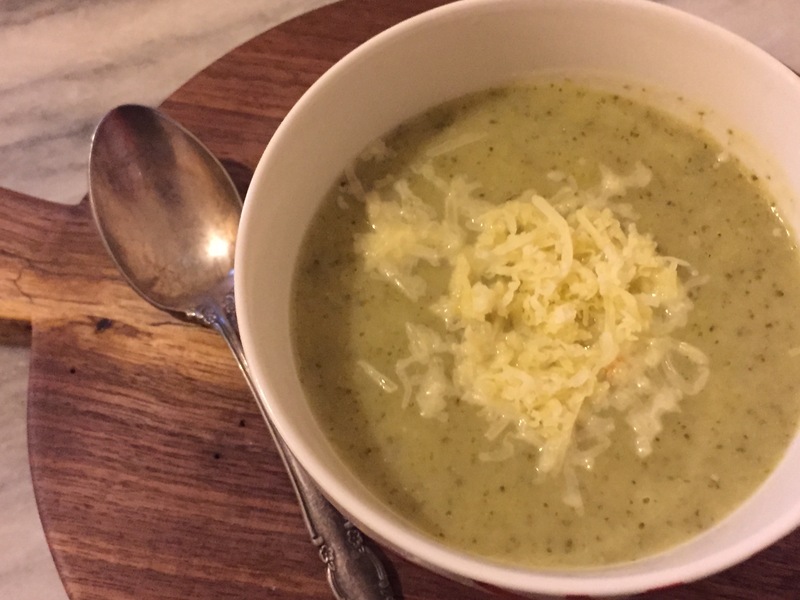 It’s really good, if your daughter likes broccoli then she would probably like this soup. So easy to make and creamy and filling! Thank you. Me too, simple food is really what I love to make. This soup is delicious with few ingredients and very little effort. Love hot soup on a cold day. Thank you. I love recipes/tips like this one Suzanne – so quick and easy to produce a great, comforting meal! Perfect for using up those odds and ends veggies too! How exciting that Downton is starting for you tonight! I still have my American iTunes account, so if it’s the same as last year I should be able to download each episode within 24hrs or so of you watching it – yippee!!! Oh very cool, so you can watch it too. Love that show and so excited to see what happens. Thank you, yes this was kind of a clean out the vegetable bin soup, mainly broccoli but a few other vegetables thrown in also. It turned out very tasty. Looks very delicious, I love Broccoli Soup!! Love broccoli, we eat it at least twice a week. I made vegetable soup today! Perfect with all the rain and cool weather we’ve had all day! Thanks this is full on soup weather. Thanks Michael. I love soup and this looks perfect for a cold day! Or any day actually! Yum 🙂 hope you enjoyed Downtown! Thanks Petra, yes loved Downton, it’s one of my favorite shows. So glad it’s back. I just love soup and eat it year around. It is definitely soup weather this week! Thanks Julie, I eat cold soup in summer and hot soup in winter so yes me too, year round. Thank you. Broccoli soup is my all-time favorite, rain or shine. Were all excited here for Downton Abbey tonight too!!! Yeah! Great idea and totally weird weather. Is that a new background???? Or have I been reading on my cellphone too much! Thanks Amanda, well no not really it is sort of new. Been in place about 6 months I think. Probably because you have been reading on your cell. Thanks so much. Except for baking, same here. I never use recipes for savory food. Thanks Fae, yes the weather is weird today cold going arctic cold this week and very windy. I just made this soup! Yum! Really, wow, thanks Cincy. Simple right? Me too, thanks so much. Thanks Jess, the other vegetables just make it more interesting. So simple thank you so much Sadia. Me too, simpler the better. Downton was good last night!! 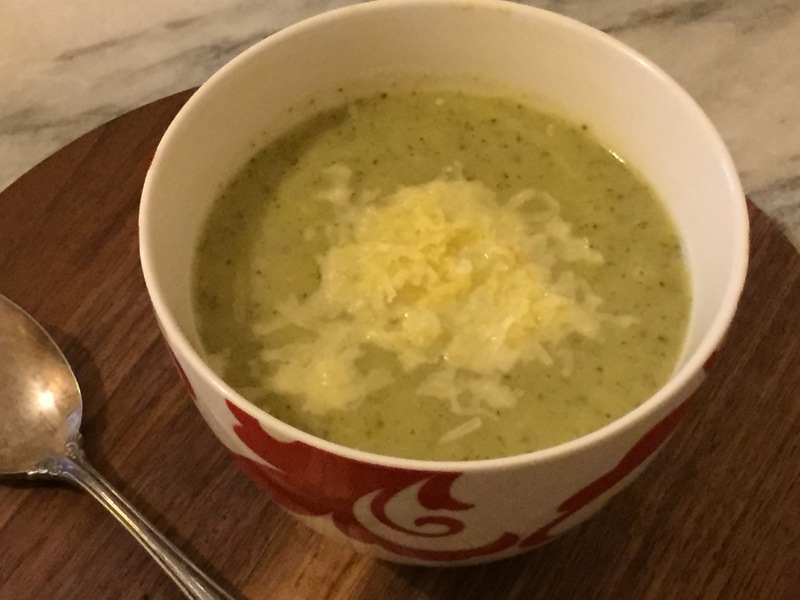 Often I am craving some broccoli soup but don’t want the extra weight of the cream, so you solved that! We just picked a bunch of broccoli from the garden so can’t wait to try this! You have the good stuff fresh as can be since you grow it. The soup is really good. Thank you. You know I love simple recipes and this looks fabulous Suzanne! I grew up eating my mother’s cream of broccoli soup. It really is so incredibly comforting. In fact, soups in general are in the top favorite foods of mine. I am seriously craving broccoli soup now, it looks gorgeous!! Oh and I am like you, I crave food opposite of the seasons sometimes too! Yes simple is best thanks Brandi I love being able to taste the broccoli, Thank you so much. If this could magical appear in front of me right now, I’d be the happiest person alive lol. I am so in love with this. Wow, this is just awesome….easy and delicious… Apt for the weather…. Thank you Chitra, it is perfect for the cold weather. Thanks Patty, yes mighty tasty soup. Your pictures make it even more appealing, Suzanne. Especially love the veggies in the pot 🙂 Very cool with the yellow carrots. Definite foodie cred 😉 Thanks for sharing another perfect recipe. Thanks Liz. vegetables and fruit are so beautiful. The colors are vivid just love photographing them. Thank you. yes love throw it in the pot sort of dishes. So simple. fast and it’s great when it actually tastes good too. I could hardly bear to look at your delicious soup as I am on a diet. The diet is the five:two one where you eat 600 calories on two days of each week and normally for the rest of the week. Tomorrow is a normal day and as it happens I have some left over broccoli in the fridge, so I think I will make a version of your soup. Roll on a day of proper food. I never heard of that diet, I am going to have to look that one up. Have you done it before and if you did it did you lose weight. Sounds interesting. The soup if you don’t add the cream and butter is very low cal, and fat. Thanks and best of luck with the diet. I am doing low carb. Oh I am going to look it up. You cannot eat whatever you want on the unrestricted days right? You couldn’t possibly it would undo all the good you did on the restricted days. I imagine you can eat but sensibly. Best of luck and off to look up the diet. Crazy weather lately! I was in upstate NY last week and it was all over the place. Crazy is right, 60 + the other day and now it’s single digits and snow and ice. Yikes. Thanks so much. it’s so easy to make. If you try hope you enjoy!! Thanks I love that carrots come in a variety of colors, the flavor is the same really but they are so pretty, purple carrots, white, yellow, orange. I’m a fan, too, of Downton Abbey – I noticed there are a couple cookbooks, and I’d love to get them, but then I think that I just don’t cook “fancy” food much. Maybe I should add another suggestion to myself…throw more dinner parties! And oh, yes, the soup sounds delish! I love collecting cookbooks, I really don’t do fancy either but every now and then it’s fun to try!!! Thank you, I need to walk more too but right now with temps in the single digits not happening. It’s so cold, hard to believe really. Soup is totally the way to go. Thanks Nancy. Thanks Christina, it’s really almost too simple. I wanted something with no fuss so made this but it would be so good and much more complex roasting vegetables and sautéing the onion but this is nonetheless really delicious. I turned on PBS before Downton but the Baking show wasn’t on, it was a special about Downton Abbey. I did see it last week, but missed it this last Sunday. What I saw I loved and think you were incredibly lucky to meet Paul and Mary. This looks like dinner tomorrow night Suzanne! I happen to have all you listed (if plain old orange carrots will do! )– and P.S.– I love Downton Abbey too! After the kids left around New Years, I collapsed on the couch and watched through ALL of season 4 (!) just to be ready for Sunday night!! It was a good one– so much packed into 1 hour!! Yes orange carrots are fine, they will change the color a bit but who cares really the flavor will be the same. Yes, Sunday’s episode was so good. I settled right in and it was like having a comfortable old friend with me that evening. I loved season 4!!! Yep– it’s just so long to wait from season to season– but I read they’ve signed on for Season 6! Sometimes simple has the best results! You don’t have to make complicated things to enjoy and feel complete. This broccoli soup does exactly that! Happy New Year Suzanne with lots of delicious treats! Happy New Year Katerina, totally agree. Thank you so much. Yes slushy snow that day, spring like temps the next then we went into the deep freeze and more snow and ice. Yuck!!! Thank you, the soup is perfect for this weather. This looks so delicious Suzanne! We all love cream of broccoli soup in my house, but my daughter Jess is the one who really REALLY loves it! I’m going to make this for her. I made some split pea soup last night for our dinner tonight…it’s nice to sit at my desk knowing that everything is all cooked, it just needs to be heated up! It’s been so cold here… the wind chill has been like -20/-25 the last couple of days! Love broccoli soup, so healthy and economical which is great after Christmas and perfect on a chilly day like this. LOVE this “recipe”, Suzanne! Seasonal perfection…and perfect for my “burned-out” on cooking mood, too. 😉 Looks like a bowl of deliciousness! I had some not-so-good cream of broccoli soup at a restaurant recently that was blah, this recipe looks great! I can’t wait to try some at home! This soup is really simple and can be adjusted for taste, thank you so much. This looks delicious! I have a bad habit of buying tons of broccoli and then not using it up before it goes bad – I’ll have to remember this recipe the next time I buy too much. What a tasty solution! I do that and hate wasting food. If I buy too much this soup is good but I also par cook and freeze. That way I have frozen broccoli when I need it. Thank you.